One of the most entertaining games of this European Championship. Germany were the better side during the first half, but never recovered from Antoine Griezmann’s strike in injury time. Didier Deschamps named an unchanged lineup, opting to leaving N’Golo Kante and Adil Rami on the bench despite their ball-winning qualities. This looked a risky tactical move considering Germany’s attacking ability, and Low’s decision to name a 3 man midfield. Joachim Low started a rough 4-2-3-1, and chose to drop all his out of form attackers (barring Thomas Muller) altogether. Emre Can started alongside Bastian Schweinsteiger and Toni Kroos, likely in anticipation of France’s midfield physicality, especially had N’Golo Kante played. While a true midfield battle was possible, Joachim Low maximized his resources, and ensured that Germany dominated possession. Off the ball, the World Champions retained a back 4, but on the ball they shifted into a formation with 3 at the back. Jerome Boateng and Benedikt Howedes moved wide, and Bastian Schweinsteiger dropped into central defense. The full backs also played extremely high up the field, pinning the French full backs deep in their own half. Mesut Ozil and Julian Draxler cut inside, and Emre Can ran forward, creating a 3-1-6 formation of sorts. Boateng, in particular, was crucial in bypassing Paul Pogba and Blaise Matuidi in midfield, particularly when they pressed Toni Kroos. The French duo had to be conservative in their positioning as they were the designated holding midfielders, and when they pushed forward to press, Kroos trusted Boateng with the ball. In turn, Boateng’s long balls towards the full backs were fairly accurate, and forced France to regroup. Clearly, Kroos and Boateng were the key playmakers of this German side. As Germany dominated, France struggled to gain a foothold in the game, and Deschamps’ selection of an attacking lineup seemed to have backfired. Despite their energy, Matuidi and Pogba never really excelled in their roles as central midfielders in a 4-4-2 when France were off the ball. It seemed inevitable that Deschamps would send on N’Golo Kante in the second half. France were leaking too many chances. Kimmich and Hector’s extremely high positions also ensured that Germany could handle France’s counterattacks rather easily, as Dimitri Payet and Sissoko were often too deep to support Antoine Griezmann. So whenever Germany lost the ball, they were only a superb Boateng intervention away from regaining it. If France were to play on the counterattack, they would need to prevent Germany from creating chances and still create their own. But Germany often found it too easy to play passes between the lines, and even when France created a chance, it was Oliver Giroud who was running in behind. This France side was designed to play with the ball, but they were getting one of it. Despite dominating the first half like true World Champions, Germany failed to score. And when Bastian Schweinsteiger conceded a penalty, it was clear that France had a chance against the run of play. Griezmann promptly converted, and without a doubt this was the major turning point of the match. Its clear that Deschamps was likely to have brought on N’Golo Kante if France hadn’t won the penalty, but the goal ended up galvanizing the French team, in no small part thanks to the crowd. Laurent Koscielny, Umtiti, Patrice Evra and Bacary Sagna were far better in preventing crosses from reaching their targets, while Payet and Sissoko helped cover more often in wide areas. 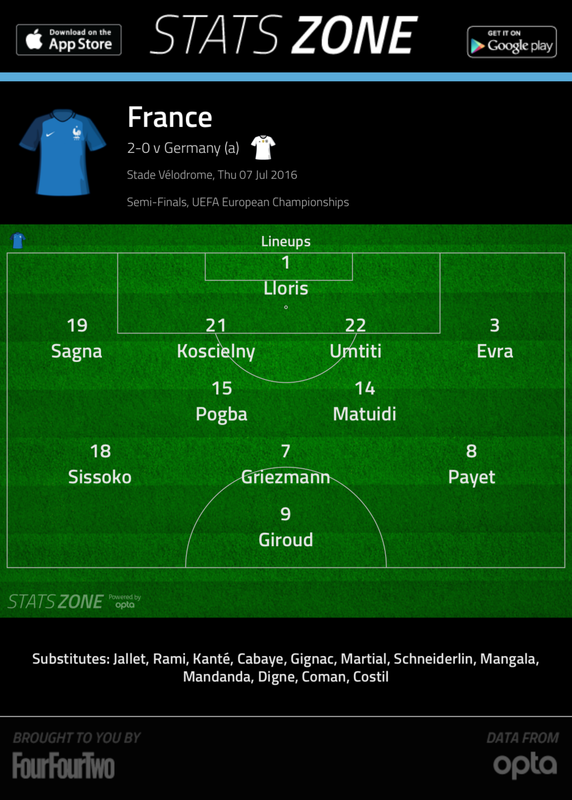 France were a far better in the second half, as their horizontal compactness also prevented passes between the lines. 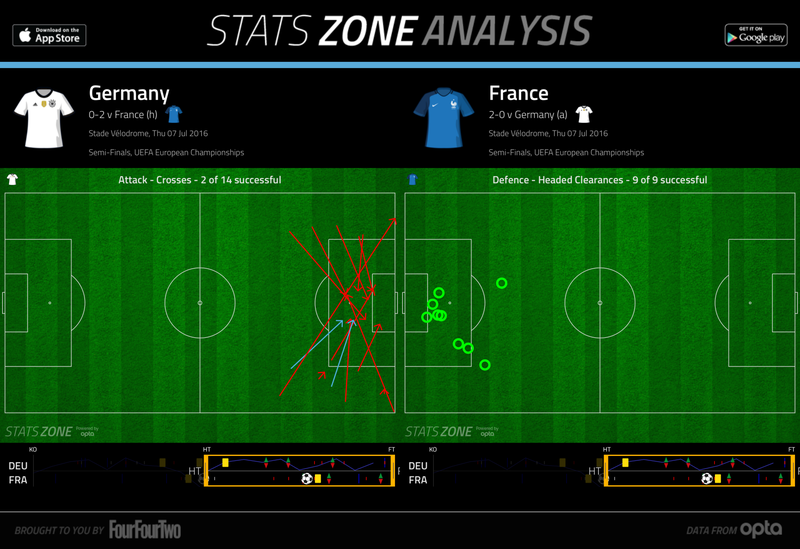 France’s improvement, the crowd, and the goal, meant that Germany had an uphill task in the second half. But the World Champions maintained their intensity in the second half until the second turning point of the match: Jerome Boateng’s injury. Boateng left the field around the hour mark, and his replacement, Shkodran Mustafi, was far from adequate on the ball. Mustafa couldn’t replicate Boateng’s playmaking, and allowed Paul Pogba to complete the cross that led to the second goal. 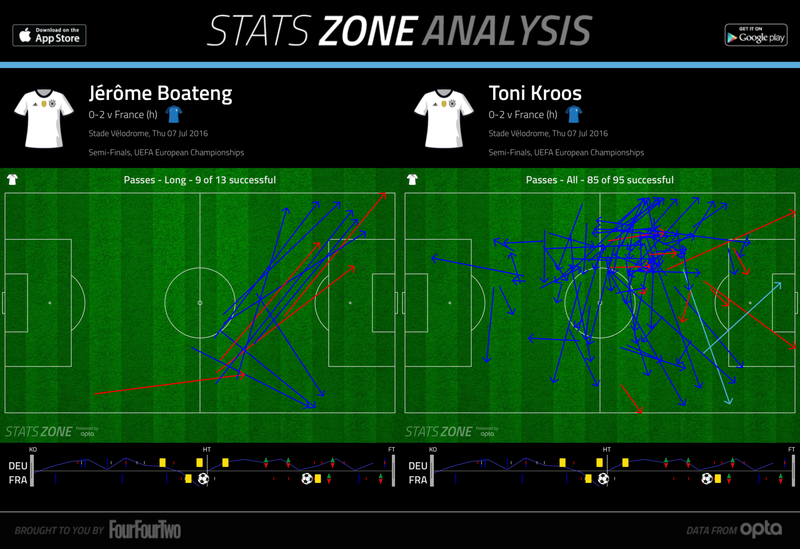 Germany also heavily relied on Kroos after Boateng came off. While Germany, still led by the excellent Toni Kroos in midfield, continued to create chances, they lacked a genuine presence in the penalty box to put them away, or were simply unlucky. Thomas Muller, who is yet to score in European Championships, often puts in better shifts alongside a recognized striker as he is used to at club level, but left alone, the Bayern Munich man was unable to lead the line. Ultimately, Germany did not lose due to a tactical error as it was against Italy in 2012, but it was due to the lack of sufficient talent. At club level, the Frenchman is used to defending deep in a 4-4-2, before springing counters. And considering that France surrendered possession to Germany in this match, Griezmann essentially played the same role for his national side as he does for his club side. The former Real Sociedad man was the difference between the two sides, and was lively all game. Griezmann also had the luxury of playing next to an aerial threat in Oliver Giroud, something which Muller would have relished had it not been for Mario Gomez’s injury. 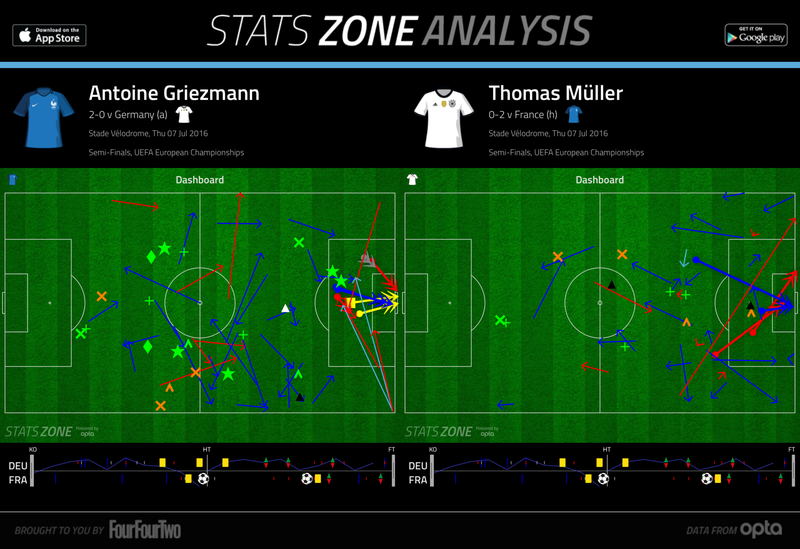 Griezmann was the best attacker on the pitch, exploiting spaces and creating chances out of nothing. Defensively, he also made some key interventions, particularly when Germany were chasing the game. Surely he is now a candidate for awards such as the Ballon D’Or; few individuals are as productive in counter-attacking teams. Germany put in a brilliant performance, both physically and tactically, but were beaten by the more efficient team in France. The World Champions dominated the game, but failed to make their chances count, as injuries eventually took their toll. 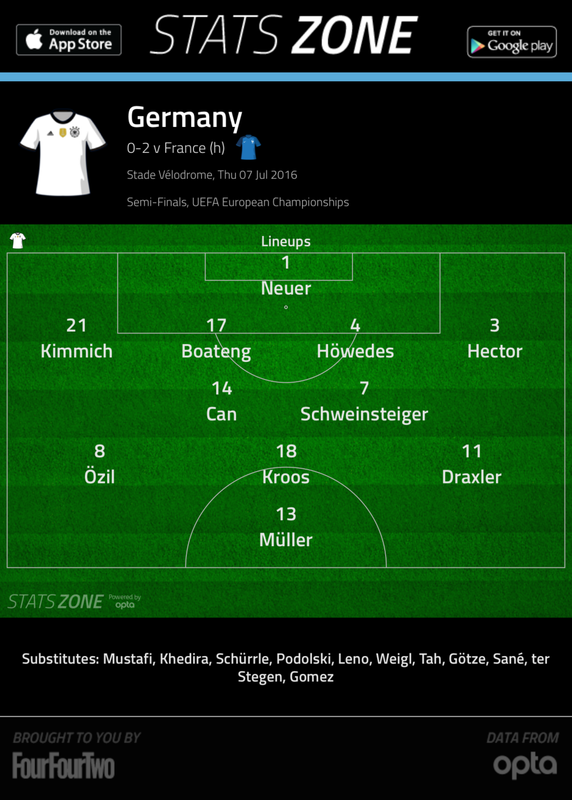 It was interesting to see how Joachim Low set up such a cohesive offensive side despite all the notable absentees. Germany retained their fluid attacking game by relying on brilliant passers of the ball, such as Toni Kroos (who would’ve been man of the match had Germany won) and Jerome Boateng, as well as the movement of Mesut Ozil. Low clearly found a 3 man defense to be more conducive to attacking play, and the fact that he could switch between a 3 and 4 man defense speaks volumes of his ability as a national coach. Tactically, Germany were spot on. But for all their talent, Germany’s last generation only have a World Cup to show for their efforts. Retaining the World Cup in Russia remains a possibility, as the majority of this team will return, but they will need a fit, recognized striker in order to pull off such a feat. As for France, the final gives them an opportunity to appropriately compete with their attacking lineup, against the de facto defensive side of the knockout stages, Portugal. The hosts go into that game as favorites, and will need to show offensive fluency if they are to avoid taking the game to penalties. Tactically, Deschamps cannot afford to get it wrong.